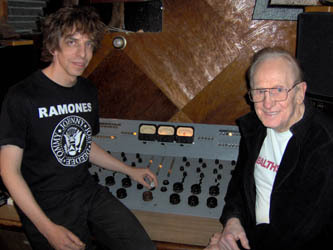 Pogo's Mark Rubel recently interviewed legendary musician and audio innovator Les Paul for Tape Op Magazine. Happy 90th birthday, Les! Mark was a panelist at the SXSW Music Conference in Austin TX. And, at the Tape Op Conference in New Orleans, where he was on a Digital Performer workshop, and moderated a panel which also includes Steve Albini, Don Zientara of Fugazi, Emily Lazar, mastering engineer for David Bowie and many others; Mark Fischbach of Piety Street Recording, and the fabulous John Vanderslice. Pogo and Mark Rubel have recently been featured in Tape Op Magazine, on the Discmakers website, and Innocent Words Magazine. Our pair of Neumann U67 microphones are being lovingly rebuilt by Mr. Bill Bradley of the Mic Shop. Our pair of Quad Eight 333C equalizers are being expertly rack-mounted by the nice folks at Boutique Audio. A very interesting and unusual microphone, the Bova Ball. Four EV dynamic microphones, thanks to Mr. Ben Juday! A strange electric tenor banjo? One of the coolest instruments ever, the Hammertone Octave 12 guitar, which will henceforth be required to be used on all records. Opera you say? Well, rules are rules. Many thanks to Kyle Lehning for his help in procuring said instrument.